This is a small, but very powerful side dish. It's nutritious and rich, and just seriously tasty. Brown butter could very well be one of the most magical things in existence, and paired with the earthiness of the carrots and a squeeze of lemon... yeah. Just try it. You'll like it. Start by melting the butter and let it brown, on fairly high heat. When it's golden, and smelling deliciously nutty and caramelly, add the carrots, onions and garlic, and lower the heat to medium. Cook, under a lid, until the veggies are soft, about 15-20 minutes. Drain the veggies (we're not saving the butter but I suppose you could), and mash them. 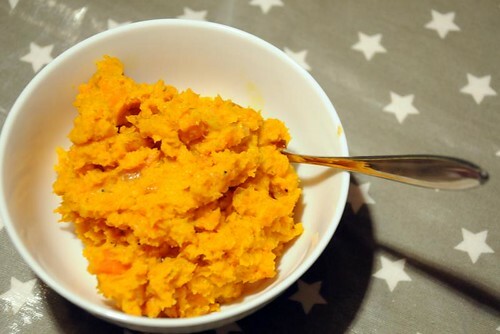 I don't bother to make a smooth purée, I much prefer a rougher mash. Season with salt, pepper and plenty of lemon. Oh YUM! Måste helt klart testa detta! This was amazing. We ended up leaving some of the garlic in larger slices because they were so delicious to flat-out eat after being cooked with the rest! Thanks for sharing!